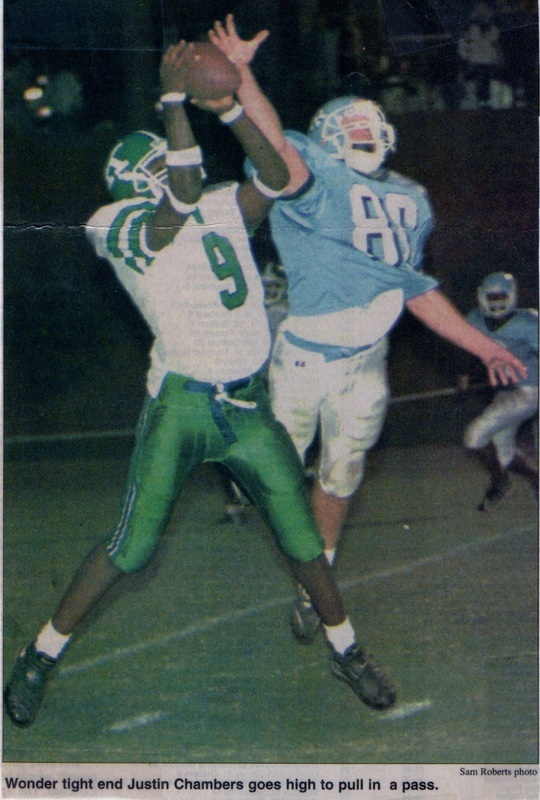 "The 1998 A.L. 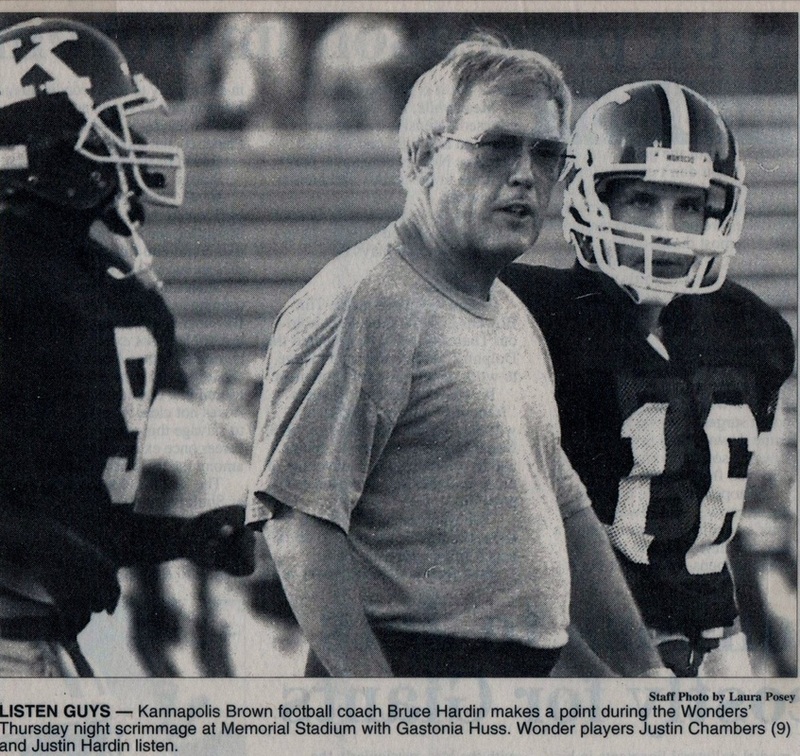 Brown Wonders"
"I Can Feel It Coming in the Air Tonight"
The year is 1998. It has been a little over nine months since the Wonders of A.L. 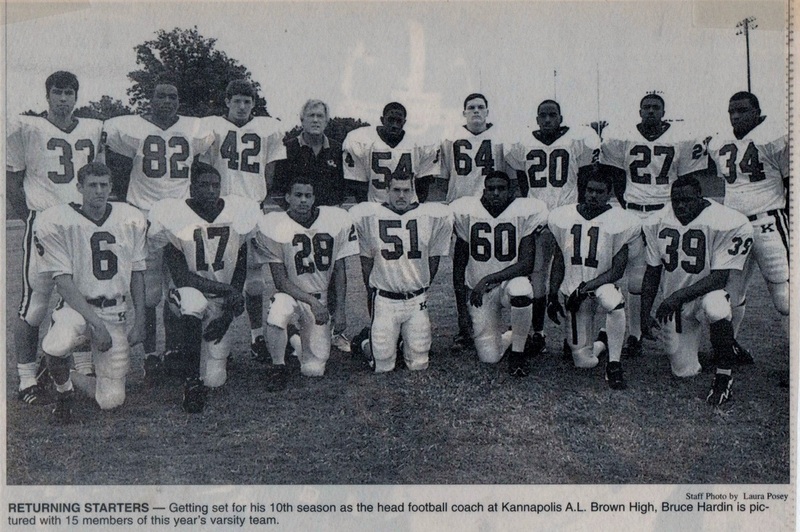 Brown High School left the field at Chapel Hill's Kenan Memorial Stadium the state AAA football champions for 1997. During that nine months graduation has taken nineteen of it's senior players including thirteen of it's starting eleven. 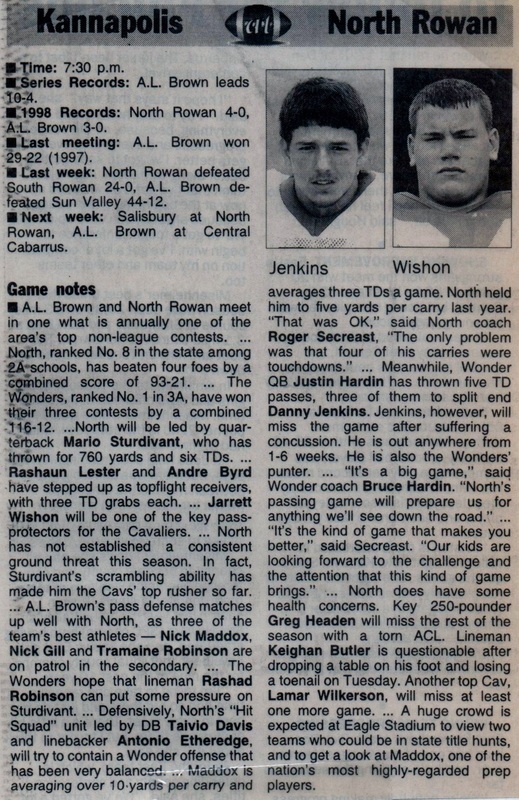 William Craft, Laron Caldwell, Traun Brown, Jeff Sheets, and two way starter Marc Kennedy from the offense. 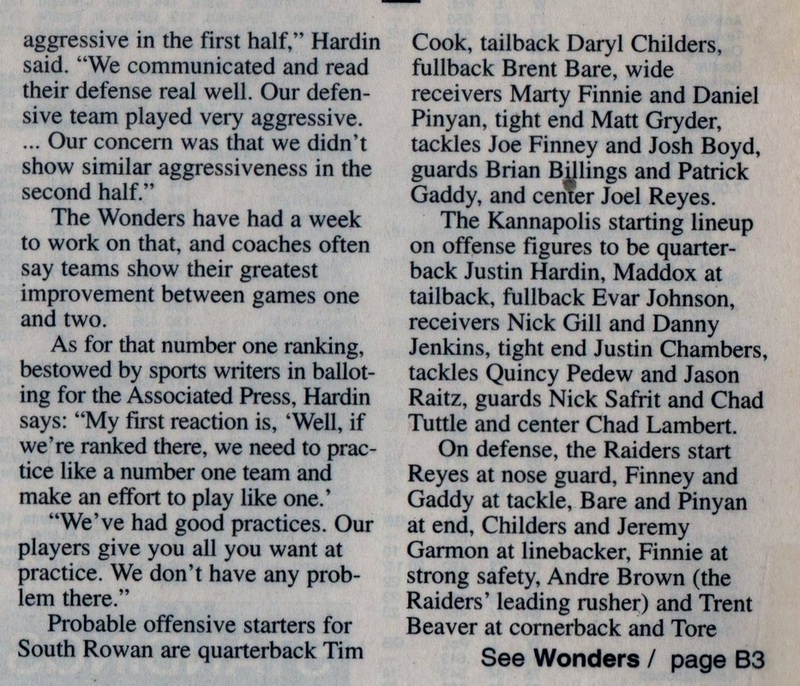 Willie Pore, Desmond Miller, Mark Linton, Phillip Johnson, Ricky Mann, and Oscar Perez from the defense, but even with the losses the Wonders still return LOADED as ever! 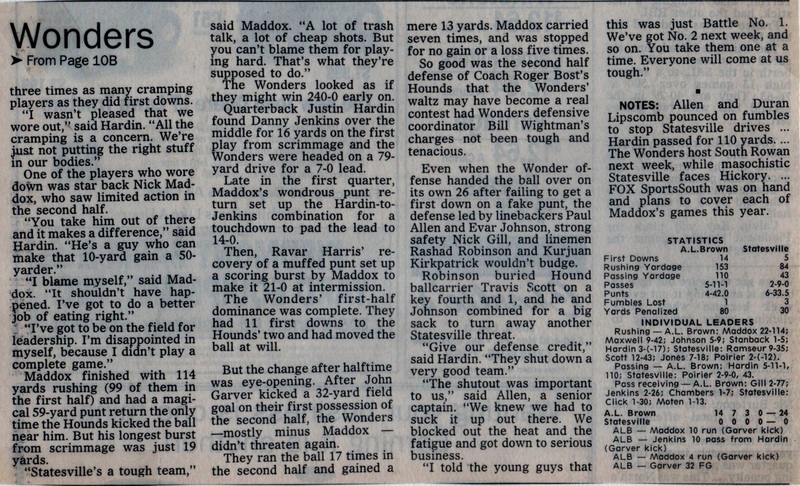 Back for their senior year are heavy hitters like Nick Gill, Danny Jenkins, Tramaine Robinson, Nate Jones, Ravar Harris, Evar Johnson, Paul Allen, Nick Safrit, Quincy Pedew, and Jason Raitz but most notably is three year starting running back wunderkind Nick Maddox. The future was so bright they had to wear shades. The possibility of repeat was a very real proposition, and as anyone who plays the game will tell you, once you get there nothing less will do. The 1998 Wonders had it all. 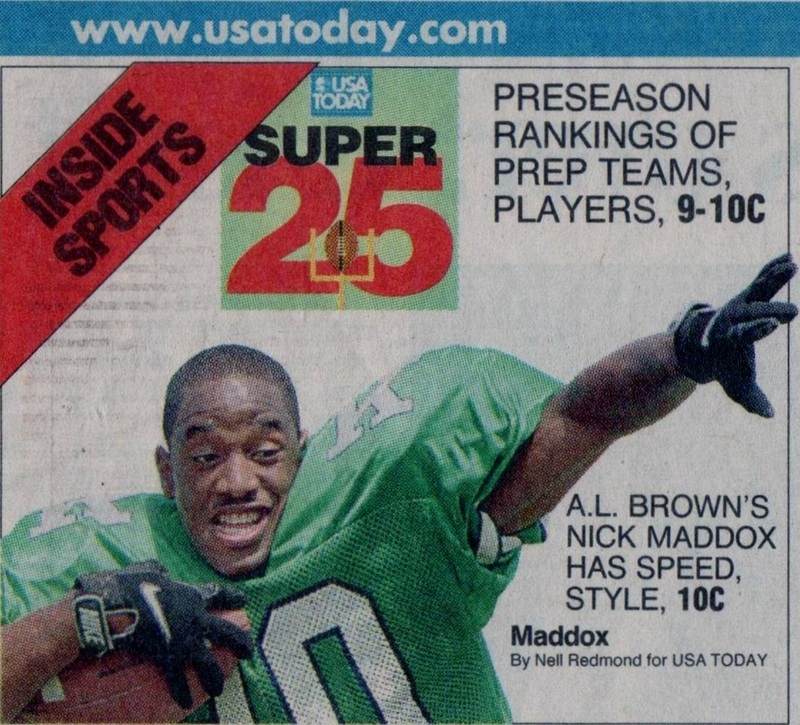 Speed, Strength, and Experience in the skill positions. If there were any questions it would be on the offensive and defensive lines where graduation took the bulk of the proven formula. 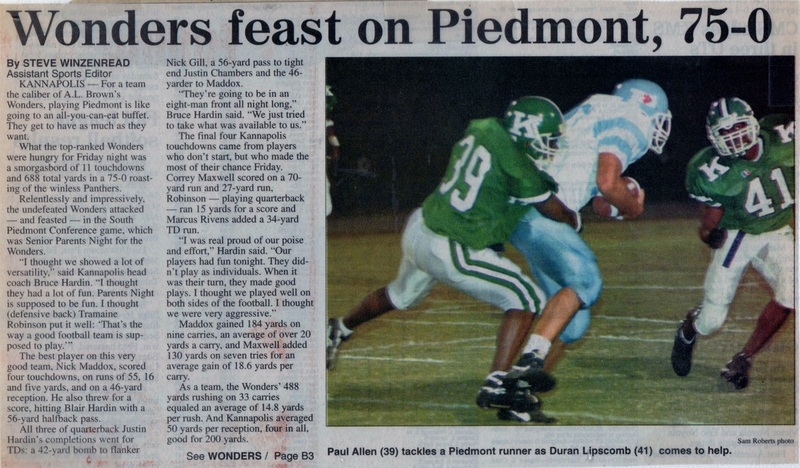 No need for real concern because the Wonders took in another South Piedmont Conference Champion JV squad from 1997 who also had ability, just not proven on the big stage of varsity competition. 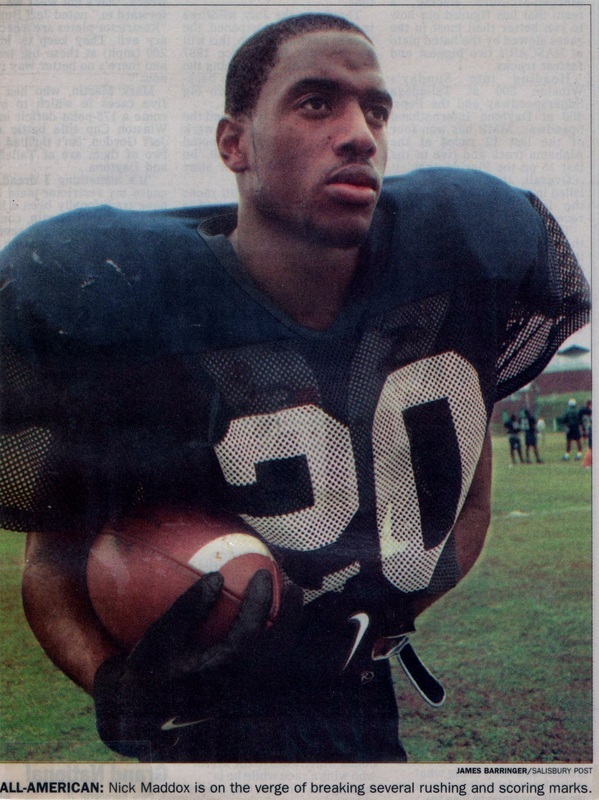 Guys like Chad Lambert, Mike Davis, Kurjuan Kirkpatrick, Chad Tuttle, Desmond Williams, and Justin Chambers. 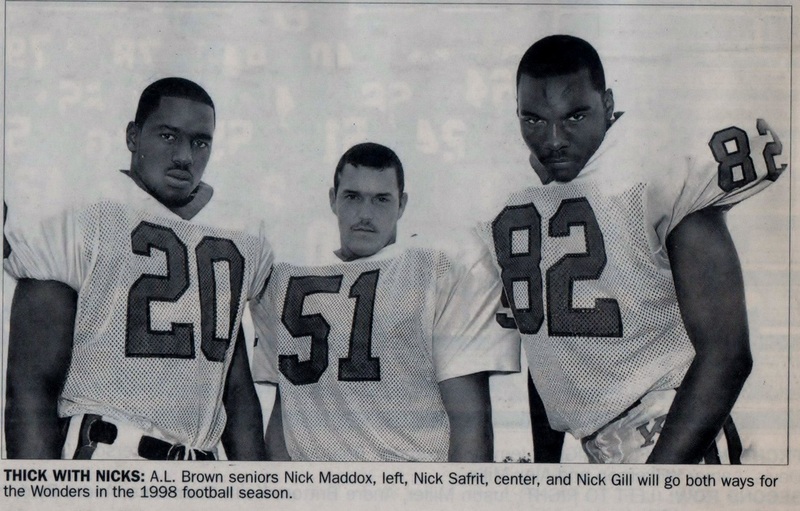 Backs Correy Maxwell, Eric Caldwell cousin to Nick Maddox, and Marcello Stanback cousin to the great Wonder RB Haskel Stanback. 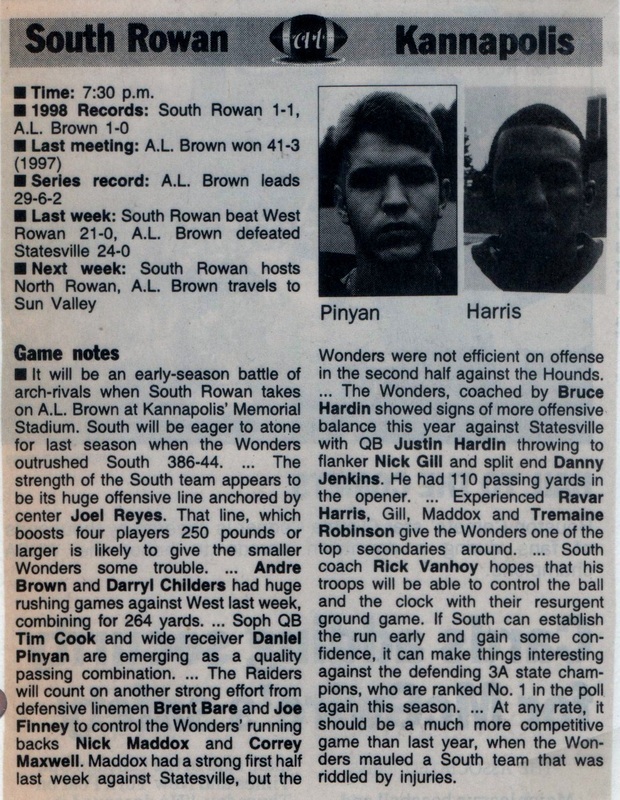 The competition in the regular season was you're usual SPC line up that included Harding, Northwest Cabarrus, Sun Valley, West, East and North Rowan, and the ever imposing group from that school down south the Concord Spiders. 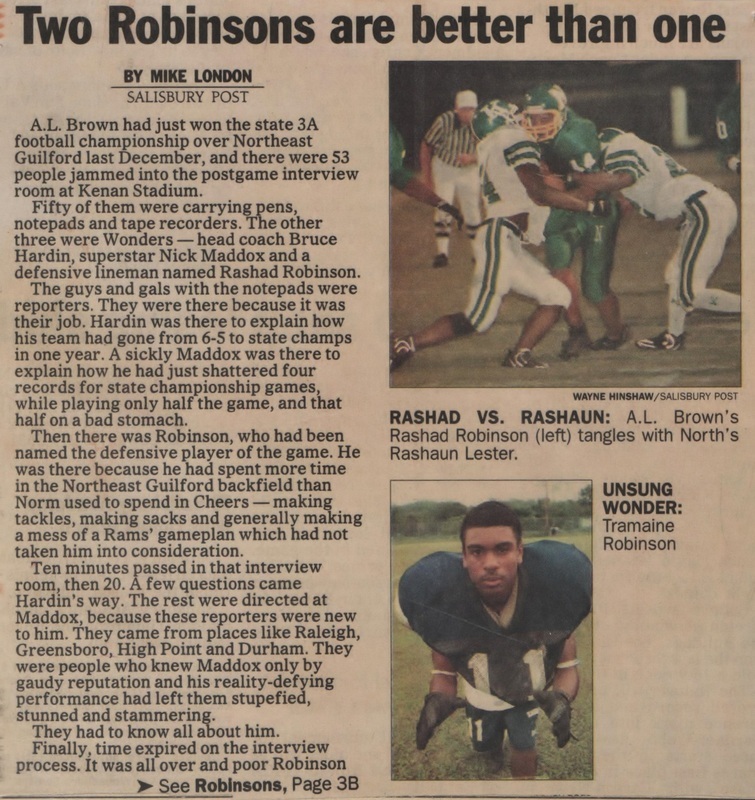 Non conference opponents were also competent in their craft with Statesville, and South Rowan, but the landscape was manageable with hard work, determination, and bringing your "A Game" every Friday night. The chances of a repeat state championship was not out of the question, especially from a team considered to be the perineal favorite with a number one ranking in the AAA going into the season. Yes the future was bright, but there were also the unknowns and things that were out of ones control. Injuries for one. 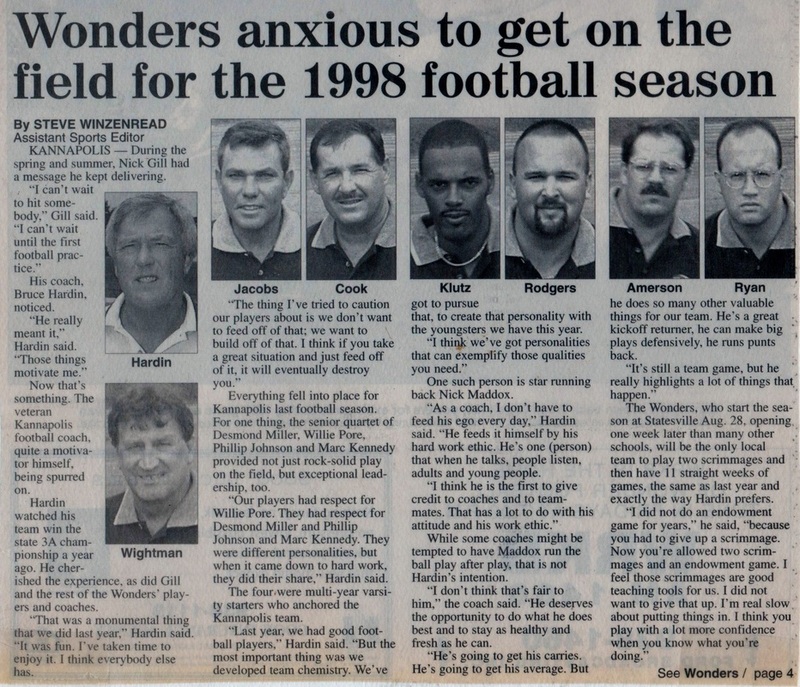 Could the 1998 Wonders navigate the landscape of an entire regular season and come away unscathed in the injury department? 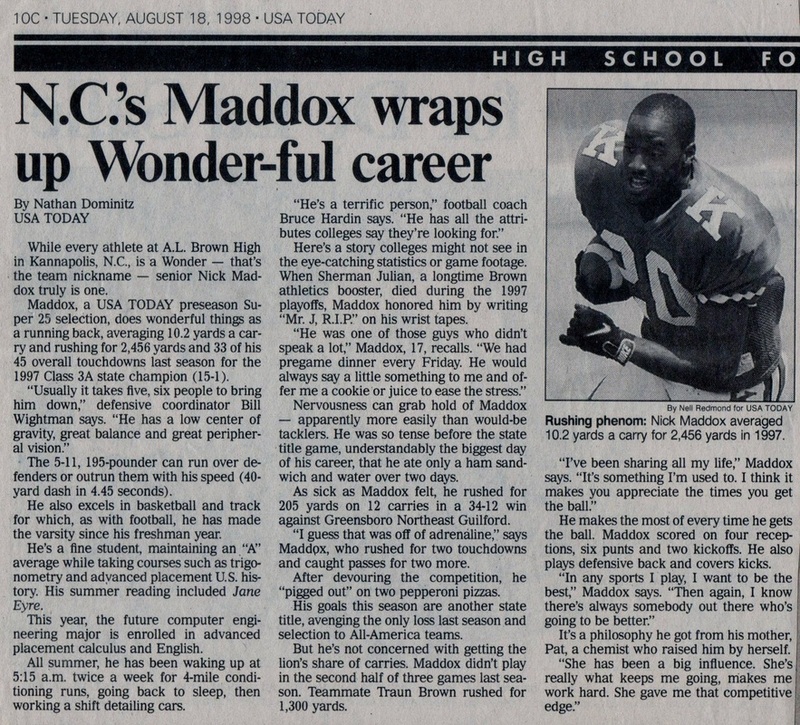 Could lightening strike twice with Nick Maddox? 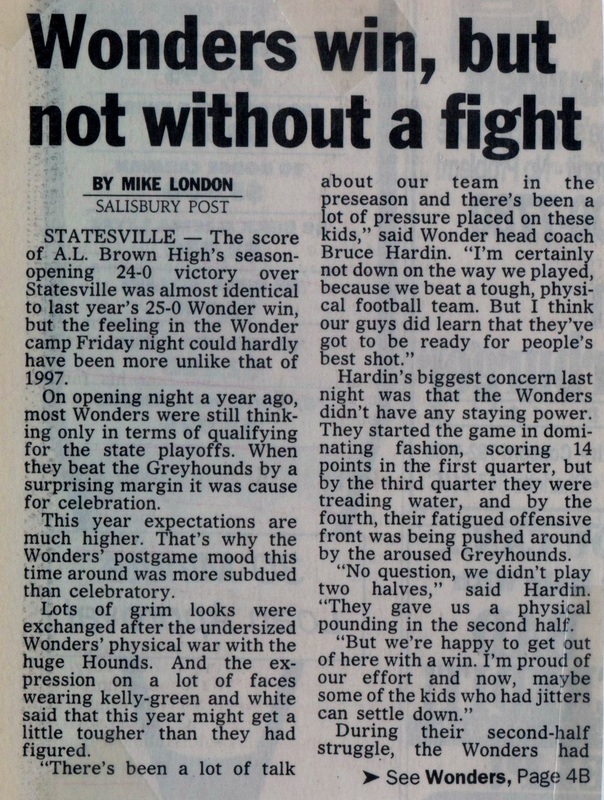 Looming in the wings for the Wonders was the one thing that was totally out of their control, and that was the competition that could possibly face them in the playoffs should they make it that far. 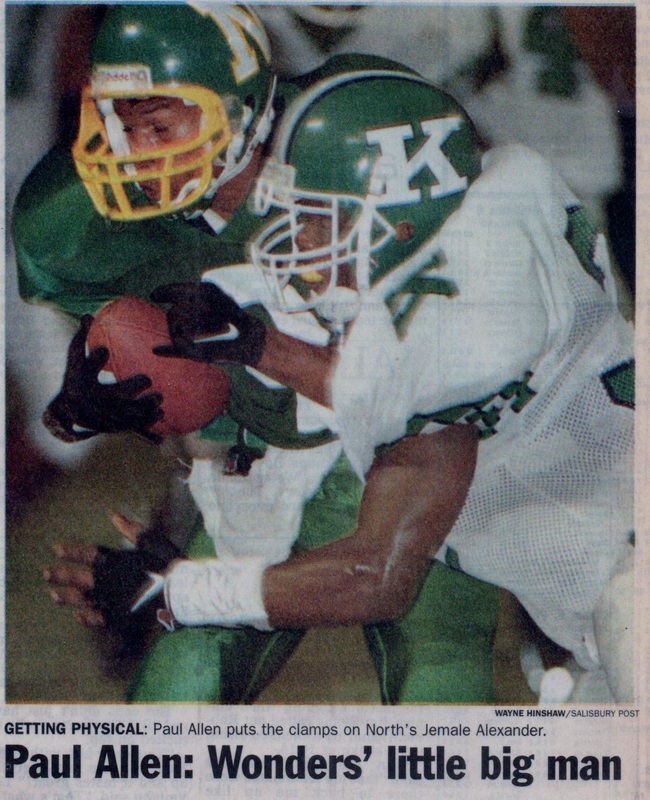 Nobody knew about East Rutherford who would rise to the top to be one of the top contenders for the title in 1998, but everybody knew of a group that resided just down the road South of Charlotte who gave the Wonders all they could handle and then some in the 1997 AAA semi finals, and that was the Mountaineers from Kings Mountain. When I say "Mountain" that was just what these guys were "Mountains of Humanity" College size athletes who were playing on the high school level. Athletes who remembered 1997 who had already begun using the 1997 defeat as a rally cry for 1998. 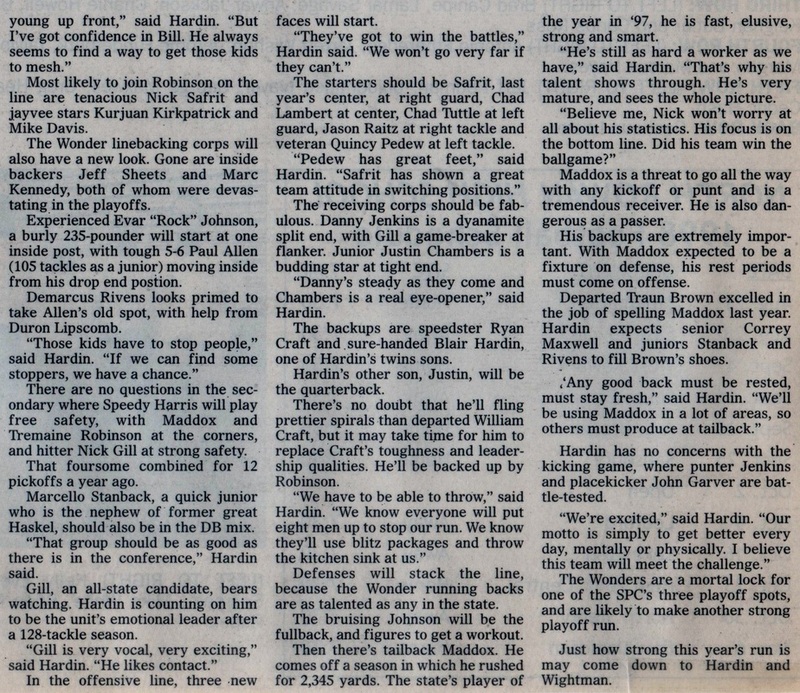 "Kannapolis-40" would be plastered all over the Kings Mountain dressing room and the phrase "Unfinished Business" would take on a whole new meaning for the Wonders later on. 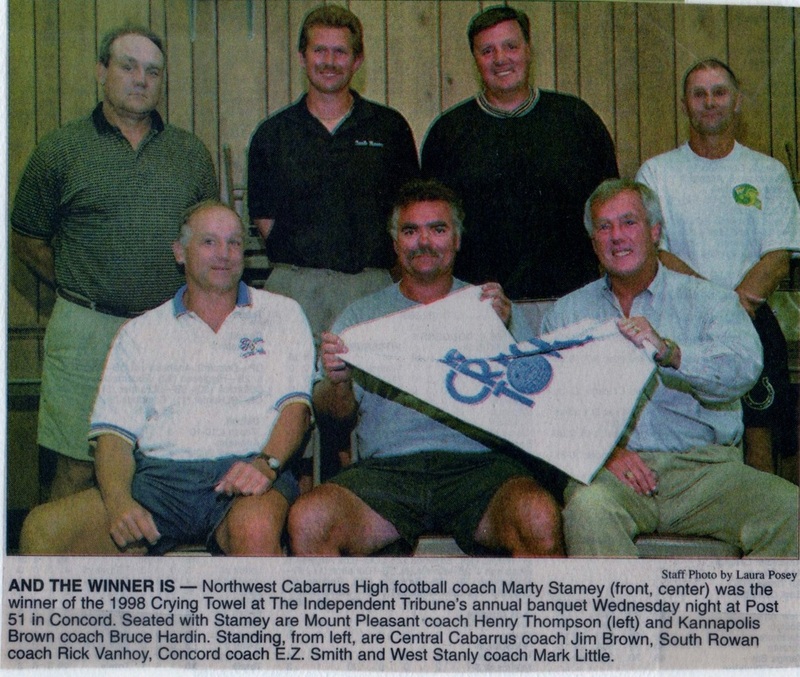 This is the story of the defending state 3A champions of 1998, and their quest to attain perfection. This is the story of one of the greatest teams to ever wear the Green and White. 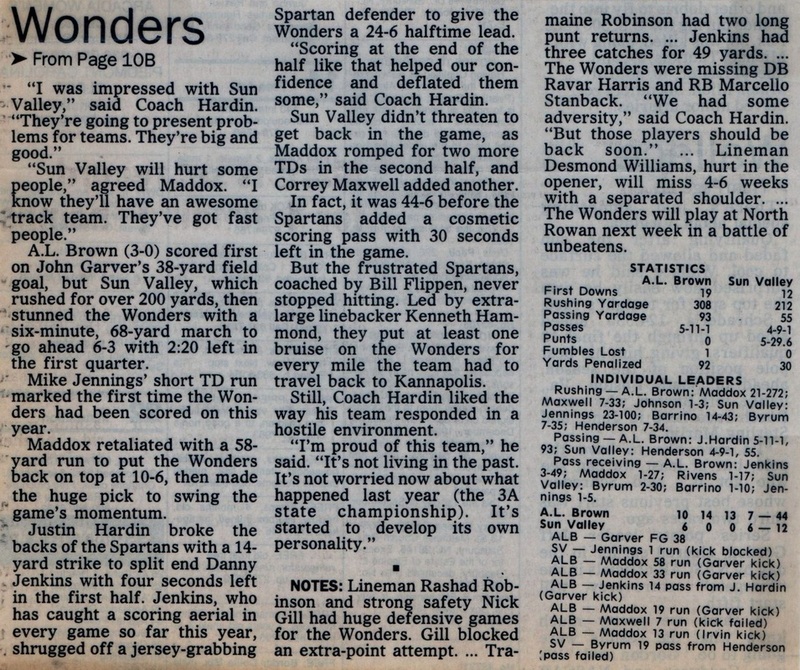 It is the story of one of the most dominating teams in Wonder football history. It is the story of a controversial 97-0 pounding and of mis matched socks. It is the story of a torn ACl and of separated shoulders. It is the story of a team with a lone star, but a team loaded with stars nonetheless. It is the story of a great journey that began in early August for thirty five young men and ended tearfully on a cold night in November. 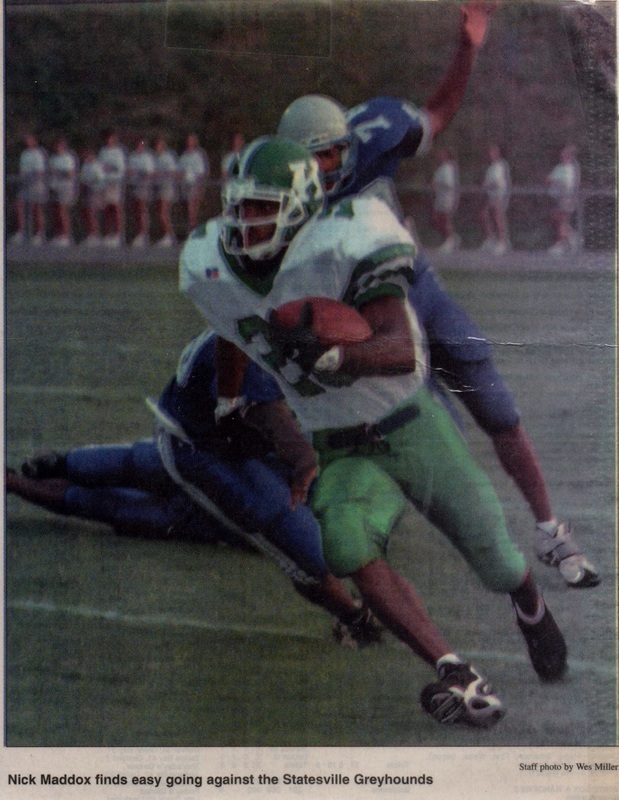 "A Legend's Senior Season Begins"
"To Go Out The Way He Came In"
"The Pre Season Days of August"
Wonder star end Danny Jenkins would receive a mild concussion during the Sun Valley game that would sideline him for the following weeks match with North Rowan. 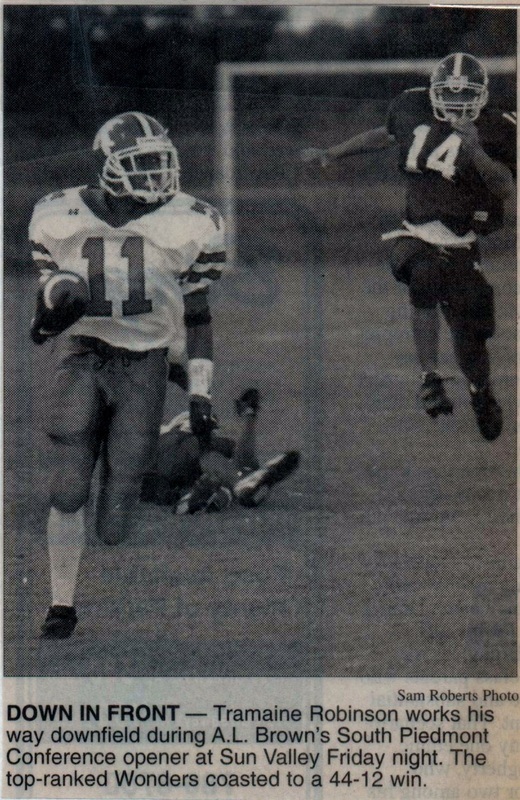 This would be the first significant injury of the 1998 season. 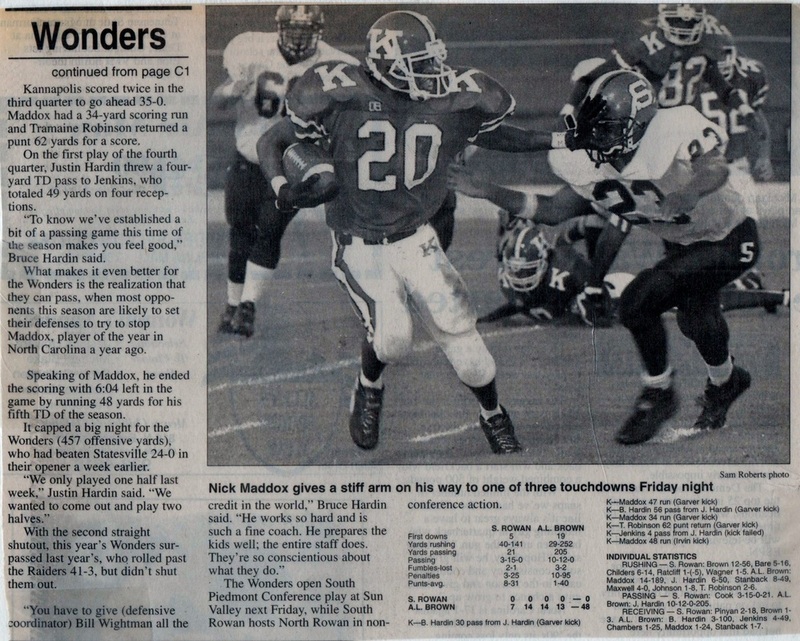 At the halfway point of the 1998 season Wonder running back Nick Maddox had already amassed 1, 204 yards and was well on his way to setting the record for all time career rushing in Cabarrus County set by Concord's Jamie Scott of 5, 585 yards. After going out with a concussion in week #3 at Sun Valley Wonder TE/WR Danny Jenkins returns to action hauling in one pass reception for fifteen yards. 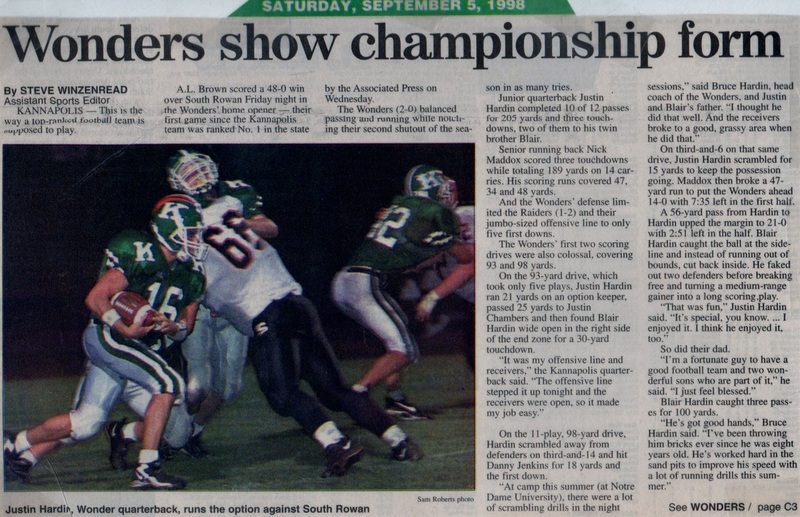 "The Heart and Soul of the Defense"
As the midway point of the 1998 season comes to a close the Wonders have run the the table on their SPC foes as well as non conference foes putting the number one ranked Wonders at 7-0 to begin the final phase of conference action. 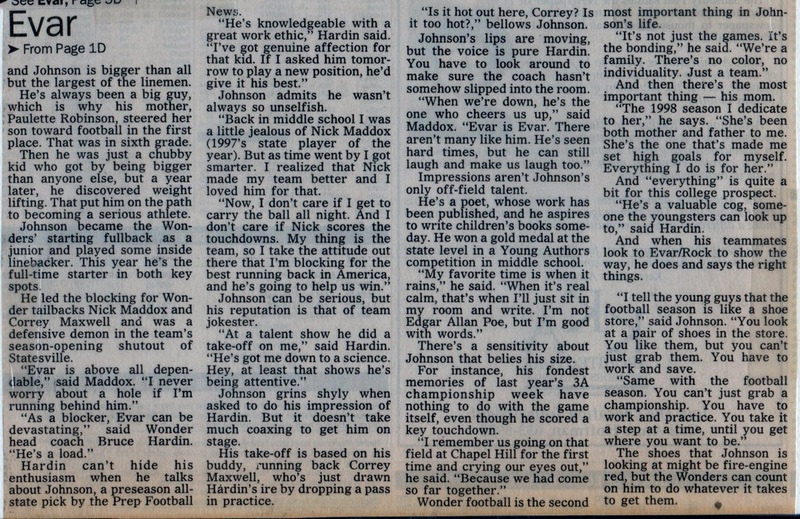 The Wonders would see very little opposition until the traditional rivalry with Concord, but the Wonders did have one thing in mind before that game and that was to exact revenge on the one team that flawed their 1997 season in heartbreaking fashion. 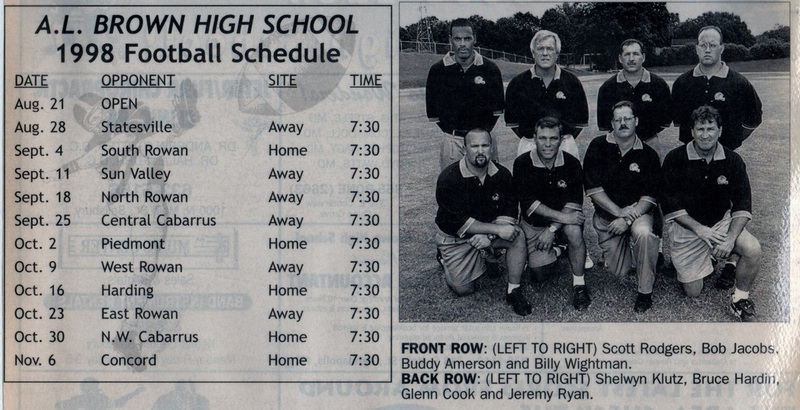 The East Rowan Mustangs had defeated the Wonders twice in a row in 1996, and in 1997 and seemed to have the Wonders number. 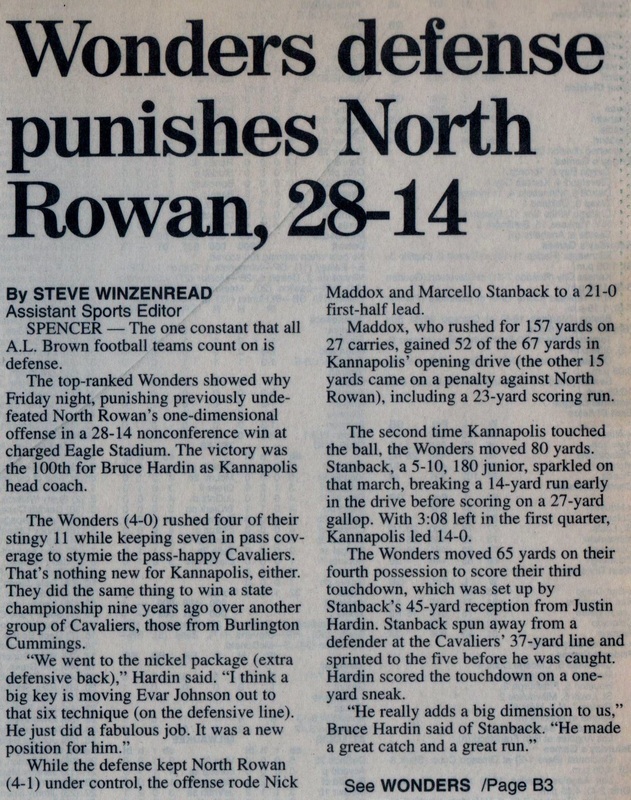 The Wonders would be looking for a cure for the East Rowan blues as they would travel to Granite Quarry to take on the spoilers of their near perfect season in 1997. Nick Maddox was sitting pretty in the stats having amassed 1, 394 yards after defeating the West Rowan Falcons in Mt Ulla. Maddox would be only 134 yards away from setting an all new Cabarrus County Career rushing record set by Concord's Jamie Scott. The Harding rams would be up next, and it was looking like Scott's record would soon fall and there would be a new sheriff in town.